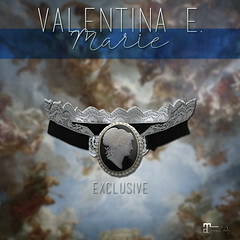 October 2018 – Valentina E.
NEW! Valentina E. Wednesday Dress! Don’t miss our brand new Valentina E. Wednesday Dress, perfect for the Halloween season or anytime you’re feeling a bit gothy! Available in four color options, exclusively for Maitreya Lara only at our Main Location. NEW! 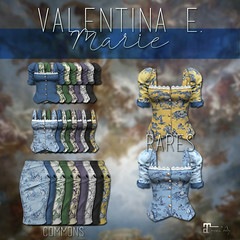 Valentina E. Helena Dress @ FaMESHed X! NEW! Valentina E. Arianna Ensemble @ Equal 10! NEW! Valentina E. Aly Sweater Ensemble @ The Chapter Four! Coming to The Chapter Four our new Valentina E. Aly Sweater Ensemble! Featuring suede shorts with polished silver buttons, a cozy wool knit sweater and an extra layer of warmth with an additional oversized sweater stylishly tied around the shoulders. Find it in five color options, only at this special event. NEW! Valentina E. Angie Suit @ FaMESHed! Out now at FaMESHed our new Valentina E. Angie suit with tee texture HUD. This super cool mod suit looks great with trainers and shades! Available in four colors for Maitreya Lara only at this special event.